328 pages. 275x215mm. Printed on gloss art paper, casebound with printed board covers. The face of the Caledonian Railway was unmistakable, whether in the remote Highlands or the bustling industrial areas of central Scotland. Hitherto, studies of the railway have concentrated on its characteristic locomotives and rolling stock. 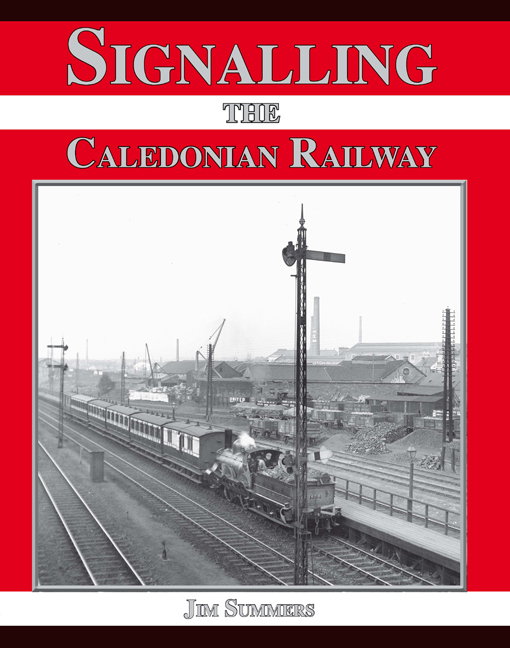 For the first time, a volume is now devoted to the Caledonian infrastructure, in particular the signals, the telegraph pole routes and the signal boxes, which also distinguished the Caledonian scene. A close look with the sharp eye of the modeller is taken at these and their associated equipment. The signalling system existed to serve the traffic and so this book sets it in this wider context, recording how methods of controlling traffic evolved ingeniously to meet changing needs and discussing the men who devised and maintained it. A valuable chapter explains the organisation, and an explanation of the work of the operating staff is supplemented by John Paton's definitive essay on the architecture of their workplace, the signal box. Its development is charted by an unrivalled collection of photographs. 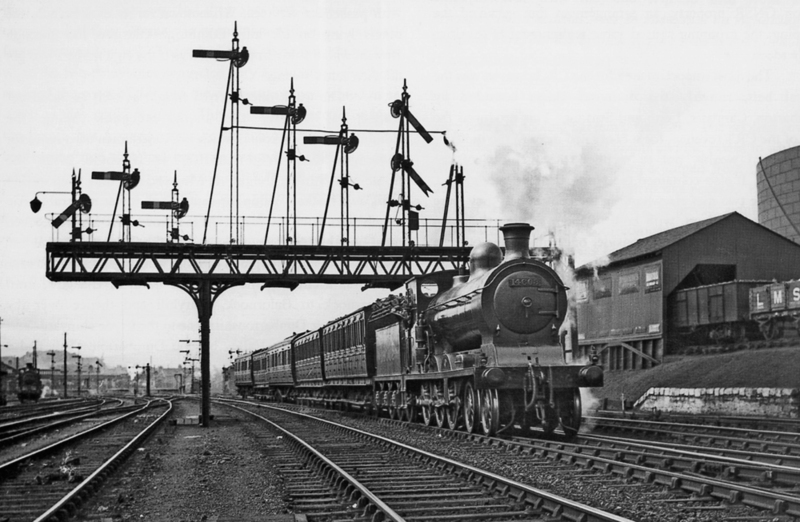 This story of how a great railway tackled safety and capacity is richly illustrated by historic photographs, which serve to throw a new and fascinating light on the Caledonian scene. Adherents of other railways who read this volume will find themselves looking at their own linesides with renewed interest, while admirers of the Caledonian will find much to sustain and enrich their passion. Continued good long distance and colour vision were essential to maintain a career on the footplate, as safety depended upon the ability of Driver and Fireman to identify from an adequate distance the attitude by day or colours by night of signals. Eyesight was therefore regularly tested and some railways set up groups of signals in a location away from the operational railway, so that examiners could set up particular displays for Drivers to identify under predetermined conditions. Some authorities believe that the Caledonian was content to test for eyesight on the live railway, using this array at Burghmuir, south of Stirling station. Former Caledonian Class ‘55’ 4-6-0 No. 14603 was passing below the characterful signal bridge when it was captured on film during a visit by the Stephenson Locomotive Society in June 1926. Note the yard lamp bracketed from the left-most signal post. Donald Peddie coll. 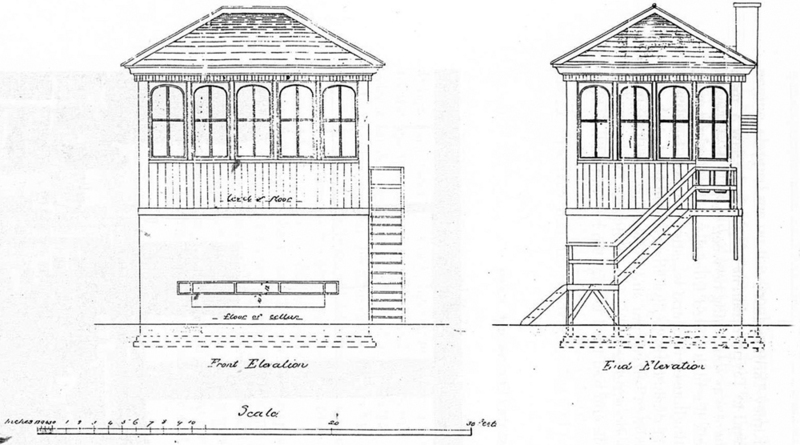 Front and side elevations of Broughty Ferry Junction cabin.